Louis was born on 31st January 1673, to John Baptist Grignion and Jeanne Robert in a small town known as Montfort-sur-Meu in the Province of Brittany in France. He was baptized on the following day . From 1673 - 1675, he stayed with Mother Andrea, a wet nurse. On 16th July 1675, his father bought a new property known as Bois-Marquer within the parish of Iffendie, not far from Montfort and the whole family came to stay there. Louise brought back to the parents and he spent ten years in this farm house. Among the ten children out 18, who lived beyond the age of ten years, Louis was the eldest. 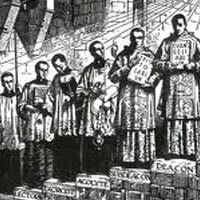 Three sons including Louis became priests and two daughters nuns. Mrs. Jeanne taught prayers to Louis and Mr. John the three R's. Louis proved to be a good elder brother to his brothers and sisters. He helped his father by coaching his brothers and sisters. He helped his father by coaching his brothers and sisters in their studies. 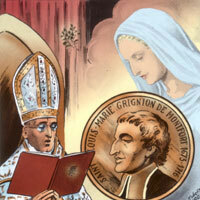 As he was devoted to Blessed Virgin Mary, he often took his beloved sister Guyonne aside to recite the Rosary. Towards the end of 1684, Louis joined St. Thomas Becket College, Rennes, run by Jesuits. During the first year, he stayed with his maternal uncle, Fr. Alain Robert, at the Church of St. Saviour. That church had an ancient statue of Our Lady of Miracles and Louis often prayed before it. As his brothers also needed higher education the Grignion family moved to Rennes in 1685 and Louis started staying with his parents. He was good at studies and he stood first in his class. John Baptist Blain and Claude Poullart des Places became his friends. One day seeing one poor student being made fun of by other students because of his torn clothes, Louis took a collection from the students themselves and got new clothes stitched for him. Louis had a strong physique and an artistic bent of mind. He showed a certain talent for sculpture and paining. His love for Mary made him join the Sodality. Sometime between the ages of 16 and 18, he had a deep experience of God and he felt being called to priesthood. After completing philosophy and at the beginning of the academic year in 1692. Louis started to learn theology. Miss de Montigny from Sulpice parish in Paris came to stay with the Grignions to get legal help from Mr. John. She, on her return to Paris got help from a rich lady, and offered to get Louis admitted into Swt. Sulpice Seminary. Louis preferred to walk the whole distance of 365kms from Rennes to Paris, His father gave him some money and his mother a new set of clothes. On the day of departure Louis bade good byte to his parents and dear ones. His uncle Fr. Alain Robert, his brother Joseph and perhaps his friend Blain accompanied him as far as Cesson Bridge, some 3kms from Rennes. On crossing the bridge, Louis knelt down and made the vow never to possess anything in his life. He gave away the money he had to the beggar and then he exchanged his new clothes with the old ones of another beggar. Having given up all, he trusted God. Louis reached paris absolutely worn out and met Miss Montigny. Her friend was not able to pay the high fees in the Great Seminary of St. Sulpice and so she got Louis admitted into Fr. Barmondiere's Community, a hostel meant for poor seminarians. As for his studies he followed the theology course at the famous Sorbonne University. During the winter of 1693-94, Louis' benefactress was not able to pay the fees. His director allowed Louis to ask for alms and get some money by keeping watch over dead bodies. Fr. Barmondiere died in September 1694 and his community was closed down. The students were divided into two groups: the richer ones joined the Little Seminary of St. Sulpice and the poorer ones including Louis joined Fr. Boucher's Community. The conditions there were very poor. As the winter of 1694 began, Louis got very ill. He was admitted into the General Hospital. He was on the point of death. 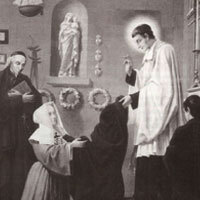 Miraculously he regained health and one Mrs. Alegre came forward to meet the major part of the fees in order to get him admitted into the Little Seminary of St. Sulpice. The rest of the fees Louis got from a chaplaincy in Nantes and thus Louis was admitted into the Little Seminary of St. Sulpice. The differences between the Great Seminary and the Little Seminary were only in fees and meals. Louis gave up his studies at the Sorbonne. He was not interested in further qualifications. Louis was not a seminarian like the rest and he was considered singular. He gave much time to prayer, penance, solitude, etc. His spiritual guides were not sure whether he was genuine or not and hence they wanted to test him. Louis chose Fr. Leschssier, the Superior of the Great Seminary as his spiritual director. He restricted Louis in his practice of prayer and penance, but Louis always obeyed him. He asked Fr. Brenier to be the spiritual director for Louis. Fr. Brenier tested Louis by humiliating him publicly before his companions and by curtailing all his initiatives. After six months he sent him back to Fr. Leschassier. 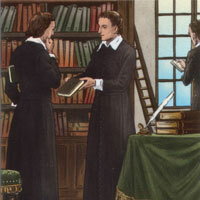 To distract Louis from his over recollectedness, his superiors appointed him Librarian of the Seminary of the Seminary. He made use of this appointment to read a large number of books especially those on Mary, Bible and Spirituality. He did well as the Librarian. In addition, he was appointed Master of Ceremonies and there too he did wonderfully well. His another duty was to teach catechism to children. By using simple stories he successfully performed his duty and became an expert catechist. He wanted to be a preacher especially for the poor. While in the Seminary he started preparing sermon notes. He also composed a large number of hymns. During the summer of 1699. He and another seminarian went on a pilgrimage to Our Lady of Chartres. On arriving in Chartres he spend much time before the picture of the Blessed Virgin. on 5th June 1700, he was ordained a priest and he celebrated the first mass on the altar of Our Lady in the St. Sulpice church. 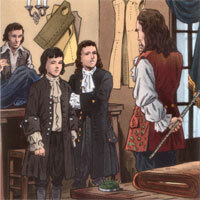 During the spring of 1703, Montfort had to face many problems in the Poorhouse and he left for Paris. There he joined the General Hospital of Salpetriere as a volunteer priest to help some 5000 poor people. His methods were not liked by other priests and he was force to leave. His friends in St. Sulpice parish did not welcome him and finally he found shelter under the staircase of a dilapidated building on the Pot-de-Fer Street, near the Jesuit novitiate. He spent the greater part of his days and nights in prayer. He longed day and night to be united to divine Wisdom. His main book of study was the Bible, especially the Books of Wisdom of the O.T. He spent much time in contemplation. He was invited by his friend, Fr. Claude Poullart des Places, to give conferences in the Holy Spirit Seminary. He collected together the themes developed in the conferences and wrote his first book, "The Love of Eternal Wisdom". Montfort undertook the journey to Rome from Poitier on foot. He had an audience with Pope Clement XI on 6 June 1706. The pope told him to preach in France itself and conferred on him the title "Apostolic Missionary". Montfort returned to Poitiers and the Bishop asked him to leave the diocese within 24 hours. He along with Bro. Mathurin went on a pilgrimage to Our Lady of Ardilliers in Saumur and to Mount St. Michael. While staying with the missionaries in Dinan one evening Montfort found a leper. He took him on his shoulders and went to the Missionaries' House. He knocked at the door and cried out "Open to Jesus Christ'. He took the poor man in and made him take rest on his bed. Montfort started organizing missions by himself assisted by others. He was capable of speaking effectively the language of the ordinary people. He made use of visual aids like statues, paintings and banners. He organized processions well. He used his own hymns. Towards the end of the end of the mission, there was a solemn renewal of baptismal vows and the consecration of oneself to Jesus through Mary. Usually he blessed a Calvary at the end of the missions. 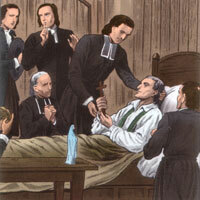 In 1709,Montfort preached a mission at Campbon. During the mission, he re-floored the church after removing the tombstones and he also removed the crest of after the property of the Duke, was not at all happy and waited for an opportunity to take revenge. 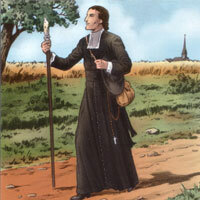 In May 1709, Montfort preached a mission in Pontchateau. After consulting the local priests, he announced to the parishioners his desire to build a big Calvary there. He got the needed permission from the Duke and prepared a nice plan. People of the neighbouring parishes came and rendered free labour. Montfort went around villages begging for food and fed them. The Steward of Pontchateau was not happy with Montfort and complained to the King that the calvary could be used by enemies during wars as a hiding place by enemies. There was an enquiry and the king passed the order for the destruction of the Calvary. The solemn blessing was fixed for 14th September 1710. The previous evening a priest from Nantes came and handed over to Montfort a message from a Bishop forbidding him the blessing. Montfrot was sad and he walked to Nantes and met the Bishop in vain. Montfort came back to Pontchateau conveyed the sad news, consoled the people and resigned himself to this great tragedy. Later the Bishop forbade him from preaching in the diocese of Nantes. 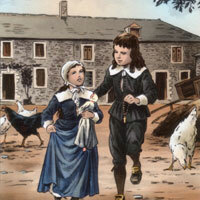 Mrs. Oliver offered Montfort a small house in Cour Cathuit, Nantes. Montfort stayed there from October to Spring of 1711 and in it started a hospital for the Incurables. Durin g the first half of 1714, Montfort met the Bishop of La Rochelle several times as he wanted to start to start free schools. He repaired a building and in it started a Free School for Boys. Only the poor were admitted . On the staff Montfort appointed a priest-director and 3 lay teachers. The teachers were dressed in black short cassocks. Reading, writing, arithmetic and catechism were taught. In 1714, Montfort wrote to Srs. Marie Louise and Catherine asking them to come to la Rochelle. It was not easy for them to leave Poitiers as the Poorhouse and Mrs. Trichet wanted to keep them. After much troubles they managed to leave and reached la Rochelle on 28th March 1715. Montfort started a Free School for Girls and entrusted it to the Sisters. The mission at St.Laurent-sur-Sevre started on 5th April. Bishop Champflour visited the parish on 22 April and Montfort gave him a grand reception. Montfort got affected by acute pleurisy and after the sermon he went to bed never to rise again. On 27th April, he dictated his Will to Fr. Mulot. In the evening of 28th April, many people came to see Montfort and the latter blessed them and consoled them. He slept in the Lord at 8.00pm on 28th April 1716 and the funeral took place on the following day attended by 10,000 people. His body was buried in the chapel of the Blessed Virgin in the parish church of St. Laurent-sur-Serve. The saint's birthplace and tomb are now sites of "Montfortian pilgrimages" with about 25,000 visitors each year. The house in which he was born is at No.15, Reue de la Saulnerie in Montfort-sur-meu. It is now jointly owned by the three Montfortian congregations he formed: the Montfort Missionaries, the Daughters of Wisdom and the Brothers of St. Gabriel. The Basilica of Saint Louis de Montfort at Saint-Laurent-Sur-Sevre is an impressive structure that attracts a good number of pilgrims each year. 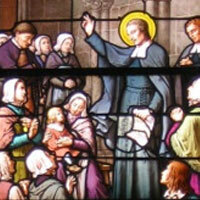 The congregations de Montfort left behind, the Company of Mary, the Daughters of Wisdom and the Brothers of Saint Gabriel grew and spread, first in France, then throughout the world.